Save money at Argyle Freed with our November store specials. 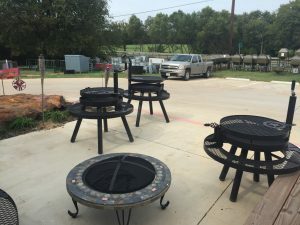 Perfect for those fall evenings, pick up a Texas Wildlife Supply Fire Pit from Argyle Feed store in November and save 10%. Available in 24, 36 and 48 inches. Get started on your holiday shopping now and save on Case Knives at Argyle Feed Store. W.R. Case & Sons Cutlery Company is an American manufacturer of premium, hand-crafted knives that are passed down for generations. Get an automatic $5 off your purchase of Taste of the Wild pet food, 30lb bags or more in November. Taste of the Wild produces premium, grain-free pet formulas that are based on your pet’s ancestral diet. This entry was posted on Sunday, October 30th, 2016 at 2:59 pm	and is filed under News & Updates. You can follow any responses to this entry through the RSS 2.0 feed. Both comments and pings are currently closed.